Hi all!! If you’re a reader who likes to check out each of the authors before heading to an event, we’ve got just the thing for you! Also, if you’re a reader who likes to win cool prizes just for reading, we’ve got just the thing for you, TOO!! 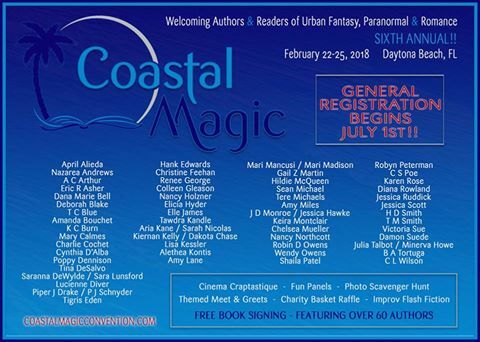 Starting July 1st (yes, the same day the registration for #CMCon17 begins), we’ll be starting our Coastal Magic 2017 Featured Authors Reading Challenge. There’s a spreadsheet available HERE (and it’s posted in the new CMCon17 Featured Authors Reading Challenge Facebook group, as well), with a listing of a good “first read” from each of our Featured Authors. Of course, if you’re already reading an author, you’re not limited to the titles listed on the sheet – any single book that you read on or after July 1st, from that author, will count toward the challenge. Level 1 — If you read & review 7 books (equivalent to 1 book per month, 7 different authors) between July 1st and January 31st — you will get a small package of swaggy goodness. This will be available to EVERY reader who completes level 1. Level 2 — If you read & review 14 books (equivalent to 2 books per month, 14 different authors) between July 1st and January 31st — you will get a small package of swaggy goodness AND a small gift from one of our Featured Authors. This will be available to EVERY reader who completes level 2. Level 3 -HALF WAY THERE!- If you read and review 30 books (that’s 30 books, 30 different authors) between July 1st and January 31st — you will get a small package of swaggy goodness AND a prize pack of cool stuff from select Featured Authors. We’re so excited to get the ball rolling on this, and we can’t wait for you all to “get to know” our Featured Authors a bit better through their stories. We’re sure you’ve all got some favorites, already — but get ready to add a few more to that list! Good luck, everyone… and Happy Reading!! (Disclaimer: Copied and slightly edited from Jennifer Morris’ post on http://CoastalMagicConvention.com.